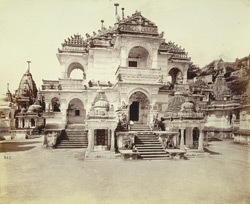 Photograph of the main façade of the great Motisah temple in Satrunjaya. Lyon wrote: ''Turning to the left on entering the enclosure and after passing in front of the two temples...a passage will be seen to the right under some trees, this leads direct to the small gate called Rampol at the entrance to the Motisah enclosure so called from the temple of the same name, which as here represented exactly faces the entrance. The coup d'oeil on entering is very striking, and though the temple is modern having been consecrated only in 1836, yet the minutiae of its details will well repay inspection, while the interior is by far the most gorgeous of all to be found on the hill."